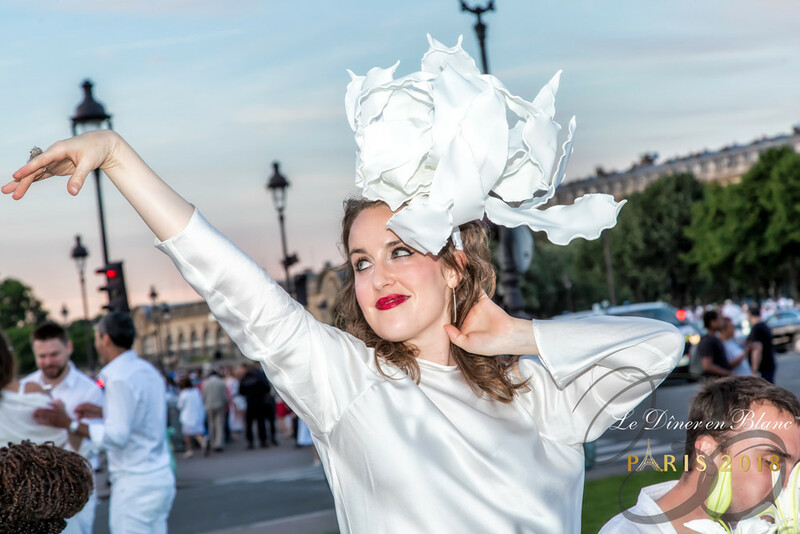 It’s Monday morning, and the hangover of my first Dîner En Blanc is almost gone. This elegant pop-up picnic was a journey. It was performance art at it’s finest, and I am officially hooked. Here is a breakdown of the night and some serious tips from a first-time attendee. This blog post is the last of a three-part series. This article is long and detailed including a mini-interview from a group leader, so grab some wine and settle in! Let’s jump right into the nitty-gritty! The initial event cost is about $98 per couple (you must attend in pairs) including membership. This price varies from city to city and covers expenses like permits, licenses, & entertainment. It does not include food. This fee is paid during the crazy waitlist mad rush. Once the registration fees are paid, there is an option to purchase food from DEB partners. 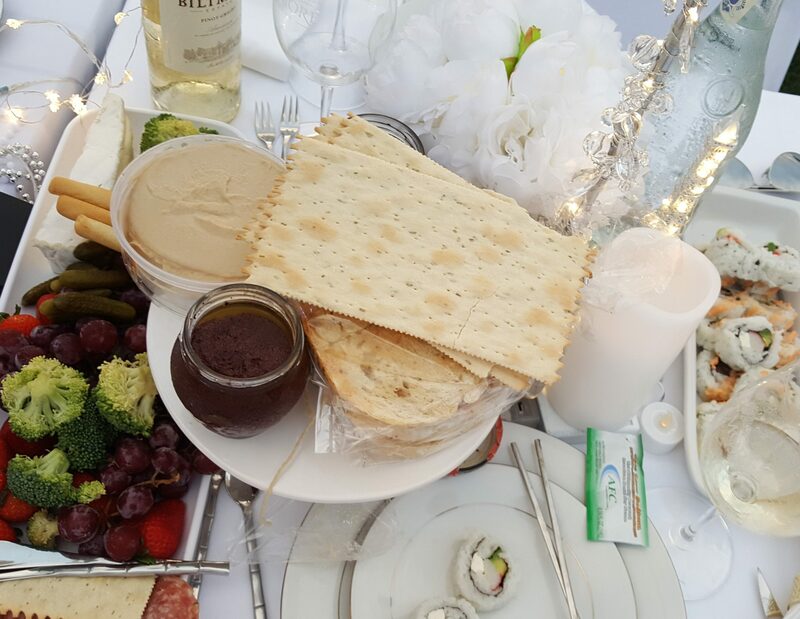 DEB organizers adhere to strict standards of partnering with local businesses, so the menu for Charlotte’s Inaugural Le Dîner En Blanc was provided by Loft & Cellar. The cost of the offerings varied from $50 – $70 per couple. I spoke with a few people who said they would opt to bring snacks to supplement what they purchased, but they would absolutely buy from a local business again because it allowed them to carry less to the event. Also, varying from city to city are the alcohol rules. In Charlotte, we had to purchase from a DEB partner, Biltmore Estates. I thought this partnership was entirely appropriate as the Biltmore is the standard of elegance in the Carolina’s. Prices ranged from about $16 – $40 and for orders over $25 you received two Biltmore wine glasses. There was also an option to purchase Champagne for $50. Partnered with One Hope a charity organization where donations are made with each purchase. I usually don’t like Champagne but the women sitting next to us shared their’s and it was delicious! I will make sure we purchase a bottle next time. This does not include your table, chairs and table decor. I spoke about that in part one, and I’ll touch on that next. When you get to the membership forum, you realize you’re now in contact with some of the professional DEB power attendees. Read the FAQ and the conversations you’ll find this to be very helpful as you navigate the unknown waters of this event. One important part about this step is, this is the time where if you’re with a group you have to chose the same group leader. This is the only way you can sit next to your friends! The idea of this gathering is to be fancy and over the top elegant, think avant-garde! It’s time to break out that China you barely use. Refresh your memory of a proper table setting. You don’t have to be super creative, but you do need to pamper yourself and your guest. You deserve crisp white napkins, fresh flowers and to hear the clink of proper glassware during your toast under the stars. If you’re creative, you should show the hell off by entering the table contest and rolling your eyes at the competition! There were some AMAZING tables out there, and if you’re a decor expert this is your time to shine! Here is an Amazon list created with the help of DEB experts. The table on this list will give you leg room, allow you to place your things under it and is easy to set up and break down. You’ll also be able to use it again for other purposes. I went with the Coleman table, but If I had to do it again, I’d purchase the one on the list recommended by experienced DEB guest. I borrowed folding chairs from my place of employment and purchased covers and white flowers for decor at Golden State Wholesale Silk Flowers on South Blvd in Charlotte. Saturday morning I woke up excited to attend a picnic I did not know the location of. I slept in until about 9:30 and ran to the beauty supply store to pick p a few small things, then spent the rest of the afternoon packing lunch and getting ready. Here is what we ate: Turkey and Brie on rosemary garlic bread with apple butter, Sushi, and a small charcuterie board. I wouldn’t wear anything but Sofistafunk. Click here to find out why. If you haven’t figured it out already, you must wear white. Not cream. Not ivory. Not eggshell. Not taupe. Not light grey. WHITE. Wedding bride white. I have heard tales from far away lands of people who have been banished forever from the Dîner En Blanc experience for venturing outside of the white attire requirements! 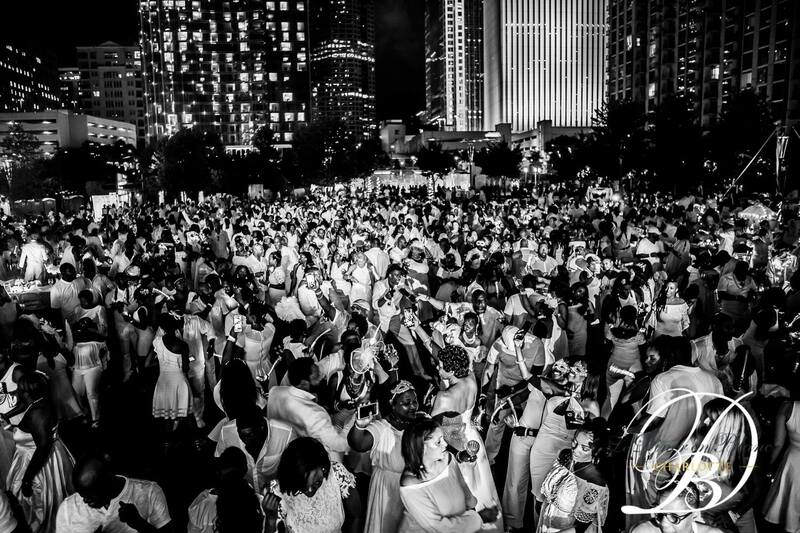 Over 1,000 people arrived and met in various parking lots around the Uptown Charlotte area, all wearing sparkling white summer attire. Men in suites dressed as though the Kentucky Derby had been relocated. Women wore beautiful white hats, some with lights and many women wore fascinators dressed like they were attending a royal wedding. People came to Charlotte to SHOW OUT! We were instructed to look for our group leader who would be carrying a sign with their name. This is where you meet up with your group, check in with your group leader and pedestrian leader, and receive your table number. You’ll also mingle with other guests. It’s about a 30 minute wait time before you parade to the secret destination. In some cities, it’s a bus or train ride. In our case, it was a 5-minute walk to Romare Bearden Park. One of Charlotte’s favorite meeting places for outdoor concerts and family picnics. As we arrived at the park, it rained for about 5 minutes, but the skies cleared in time for sunset, setting up a beautiful evening. There is no amount of research that can prepare you for this event. At first, I was a bit frustrated about the process of the table set up. They really make you hustle to get those tables set and aligned to make it look like a really long community banquet table. Then it’s time to unpack and set up. We had about 10 -15 minutes to set up your table decor, and it was a bit stressful. I was laser-focused on getting my table set. Hubby went to get the wine and when he returned I finally looked up. I was not prepared for how absolutely beautiful everything and everyone was as it all came together. It was breathtaking. Jazz playing by the Terrance Young Experience, acrobats, performing, and smiles everywhere! I wasn’t prepared for how much people shared their food, and the collective of community interaction. I wasn’t ready for the engaging conversations and…the…love. Hugs upon hugs from complete strangers! I was told that there would be dancing, but I didn’t know that DJ Shogun would be showing out with old-school hip-hop and trap music having all of the DEB guest partying under the stars until the noise ordinance kicked in! There was a pretty impressive photo booth I never made it to because I could not stop dancing! #dinerenblanccharlotte was a real buttoned up formal situation until @djshogun13 put @fatmanscoop on. Now look at us. WHO LIKES ALL THIS DRAMA JUST FOR A PICNIC? Who would want to be bothered with all this fuss? What type of people would pay to jump through all those hoops, to pay for a picnic you have to schlep table and chairs too? People who love to travel, creative people, and social people who consider themselves foodies. Le Dîner En Blanc is not for people who don’t engage with strangers (If you hate the hibachi bar you’re gonna HATE this! ), people who don’t like the outdoors and hate packing. DEB is performance art, fashion art, and community art. The aesthetic of a community dressed in all white, fine dining together lends itself to a spirit of hope and joy that is very much needed today. 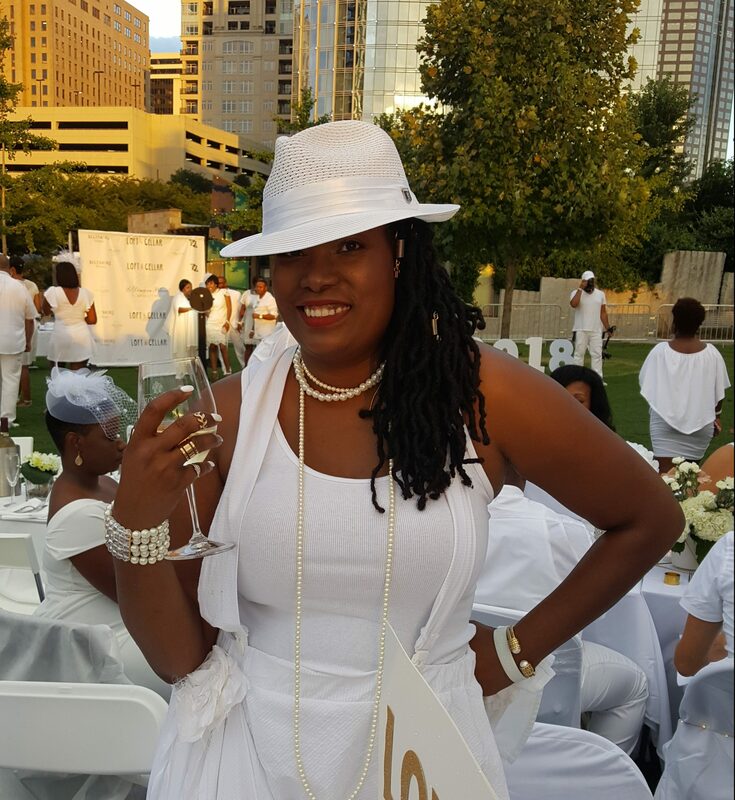 I had an opportunity to speak with my group leader D. Henry, a technology release manager in the banking industry who enjoys being a volunteer for Dîner En Blanc. When I asked her what she loves about DEB, she said: “I love the vibe, the mystery of the location, the planning (that’s a love-hate thing!) the people are always great and who doesn’t enjoy a good party! When I asked her how she got hooked, she shared that her love for travel led her to this beautiful event. Friends in other cities have offered her a phase 1 or 2 invites, and she would crash with them. I learned that this is how Dîner En Blanc has been able to keep the integrity of the secret picnic. You can’t buy your way in, it is by invite only, and if you don’t follow the rules to the letter you will not be allowed back! Pack light! This is advised for a few reasons. Mostly mobility. Remember you have to walk and/or public transportation. When things fall off carts, it delays the process of getting into the secret location. Another reason to pack light is that you’ll be walking around the venue taking in all the beauty and having a good time. You’re not at your table as long as you may think. Secure your cart, so nothing is falling. Comfortable white/neutral shoes! Pack the cute fashion footwear for later. Remember you’ll be walking! Wear white! Organizers work really, really hard to put together a magical evening. Please don’t cheat on the all-white dress code. It’s a real “smdh” moment for those who worked hard for the affair. Pack Patience! Getting thousands of people to set up a community banquet table isn’t easy! Work together, help your neighbor. It’s all worth it! Listen Carefully! Be on time. Listen to your table leader. First, you set up your table and follow directions to make sure your table is lined up correctly. THEN you decorate. This is important because you don’t want to start setting up and have to move again. Listen carefully for the official dinner wave. There will be several announcements preparing you for the big moment! HAVE FUN! It’s a fun magical evening. Every effort is worth it. Take plenty of pictures, enjoy the art of the tables. Dance! So, my wonderful readers, you made it to the end! You now know all I know about Dîner En Blanc. Is it worth all the fuss? Absolutely! Will I go again? Yes! I’m planning 2019 for Charlotte, considering Charleston and Costa Rica! The only thing I’d do differently is to bring less food. I didn’t realize I’d be away from my table so much walking around and mingling with so many people. It’s a real event that everyone who enjoys social events should try to attend at least once! 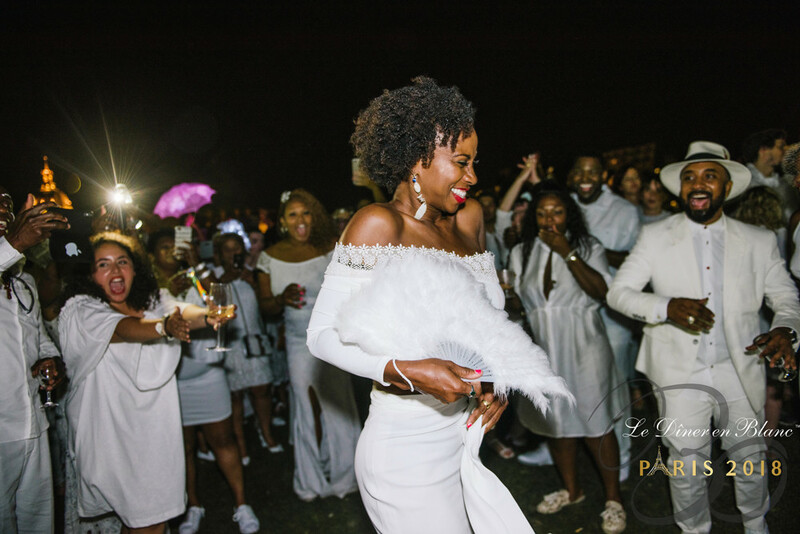 Previous Previous post: Dîner En Blanc: Charlotte | Deuxième Partie – Phase Three Waitlist!